TRITON Applied Reef Bio-science invented analytical seawater testing (ICP-OES) for reef aquariums in 2008. Tens of thousands of aquarists worldwide - ranging from hobbyists to professionals - trust TRITON’s unequaled knowledge and experience in sea water testing. With tens of thousands of analyses completed on wild reefs and home aquaria TRITON leads the aquarium industry in complete understanding of seawater. TRITON is the only company in the world to be able to offer truly useful expert advise based on this long term understanding of seawater. ONLY TRITON offers the most advanced analysis AND ongoing support needed for the modern aquarist. TRITON’s commitment to innovative reefkeeping led them to develop proprietary methods to precisely measure seawater that due to technical difficulties was not possible in the past. Today TRITON continues to lead the industry with constant innovation and new groundbreaking products and services. 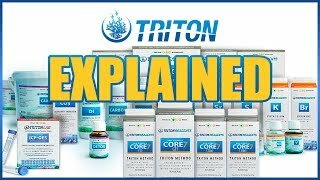 Simply purchase a test kit, register for a free account at https://www.triton-lab.de/en/, create an aquarium profile, register the included barcode, take the samples, and send them to TRITON Lab. By using TRITON ICP-OES lab testing not only do you receive valuable information which helps your own aquarium, your results also contribute to the world’s largest study of closed seawater systems. TRITON uses this database to understand and model seawater which in turn comes back to aquarists as advice and revolutionary new products and services such as CORE7. Know what's in your water!